It is always great to look for comets during the Christmas season. 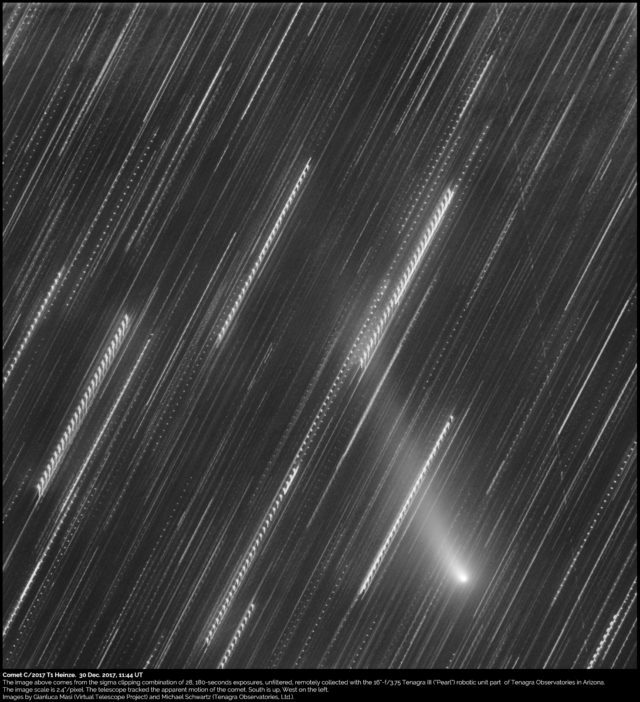 Comet C/2017 T1 Heinze is the brightest one we see these days: we imaged it several times, enjoying its nice, dusty tail. Comet C/2017 T1 Heinze was spotted on 2 Oct. 2017 by astronomer Ari Heinze during the activities of the Asteroid Terrestrial-impact Last Alert System. At that time, is was faint (mag. 18 or so), but week after week it brightened, while it approached both the Sun and our planet. It will reach perihelion next 21 Feb., while tomorrow, 4 Jan., it will touch the minimum distance from us (33 millions of km). Bob King wrote a nice article about this comet for Sky & Telescope. The image above comes from the “sigma clipping” combination of 28, 180-seconds exposures, unfiltered, remotely taken with the 16″-f/3.75 Tenagra III (“Pearl”) robotic unit part of Tenagra Observatories in Arizona. The telescope tracked the comet during exposures. This image was obtained as part of an important partnership between the Virtual Telescope Project and Tenagra Observatories, ltd. Soon, this merging will be formally announced.